How to load crystallographic properties of the SX or of the BX ? material parameter files for the subroutines that implement the constitutive model. 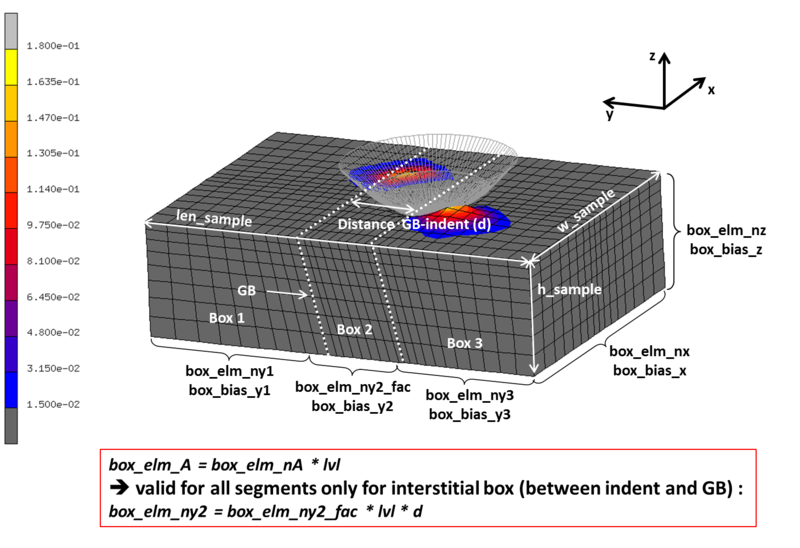 A parametrized visualization of the bicrystal indentation model through the GUI allows tuning the geometry and finite element discretization and the size of the sample and the indenter. Please find here the Python package used to generate the SX and BX indentation models. from a YAML configuration file (from the menu, by clicking on ‘preCPFE-SX’ or ‘preCPFE-BX’, and ‘Load Single Crystal config. file’ or ‘Load Bicrystal config. file’). Figure 24 The different steps to set the preCPFE GUIs. Analysis of the orientation dependent pile-up topographies that are formed during single crystal indentation provides insight into the operating deformation mechanisms. CPFE simulation of single crystal indentation has an important role in clarifying the influence of the single-slip behaviour of different slip systems on the resulting surface profiles. 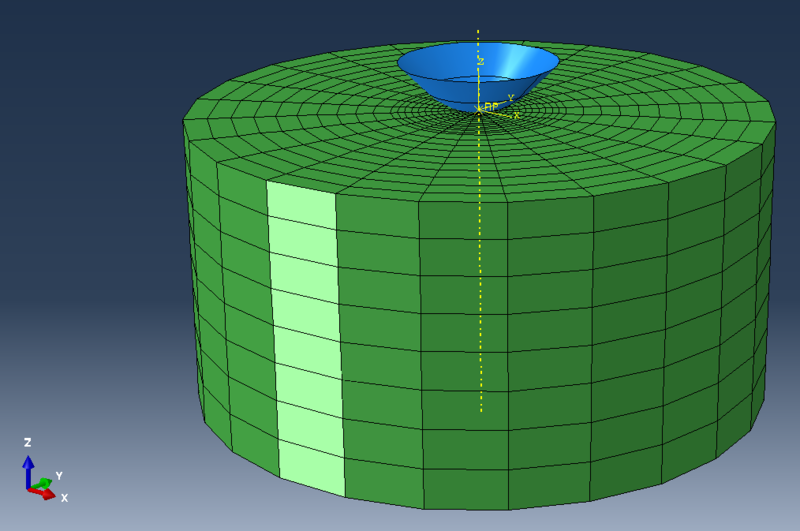 Figure 26 Screenshot of the single crystal indentation model in Abaqus. Figure 27 Convention used to define the single crystal mesh. CPFE simulation of indentation close to grain boundaries can provide a good approximation of the local micromechanics in this experiment. While models that take into account the micromechanical effect of the boundary are the subject of ongoing research, most geometrical and kinematic factors are taken into account by employing a local phenomenological crystal plasticity formulation in the simulations. 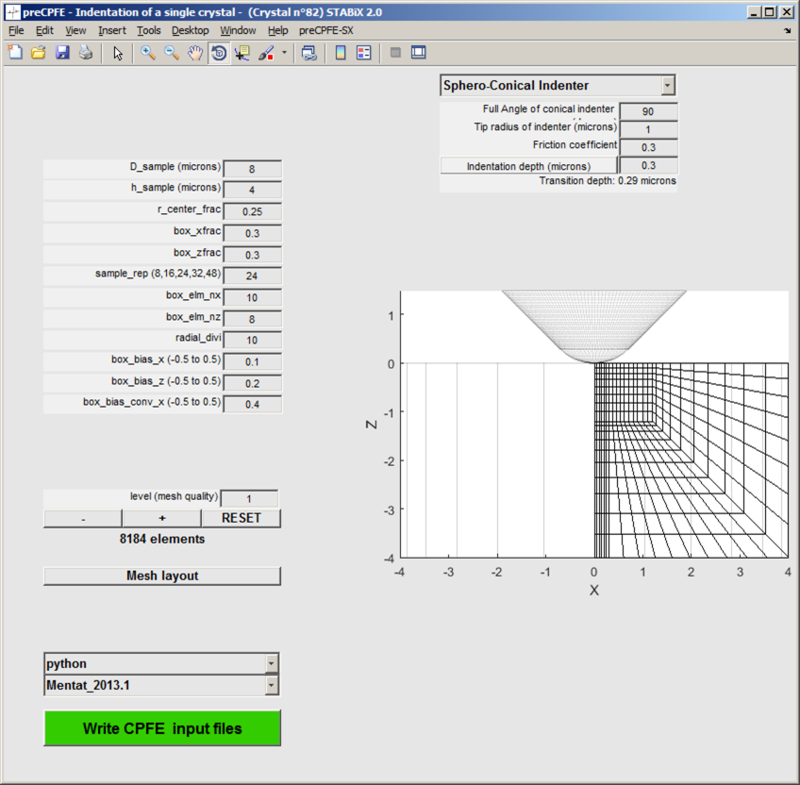 Figure 28 Screenshot of the preCPFE GUI for the bicrystal indentation. Figure 29 Convention used to define the bicrystal mesh. 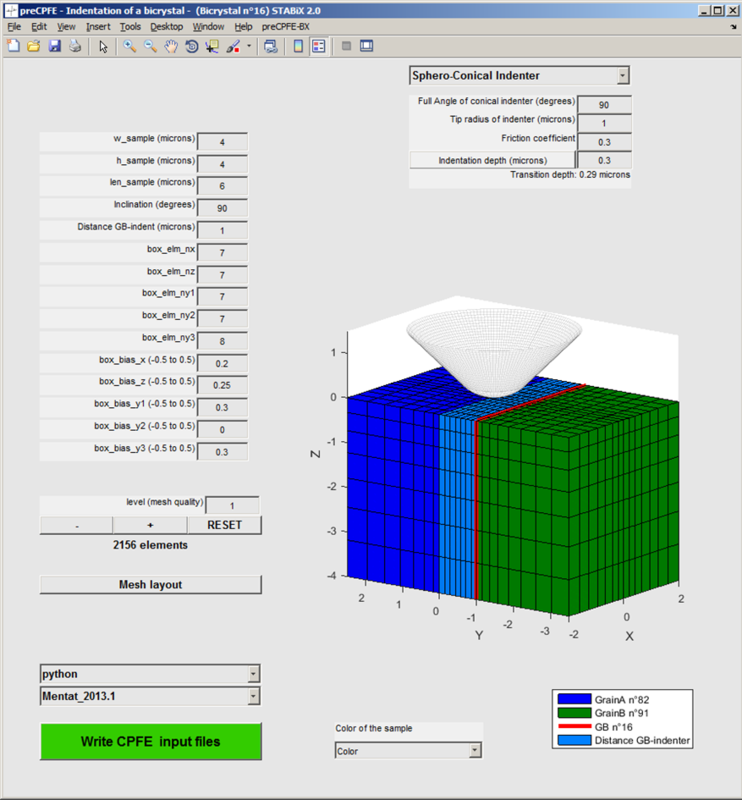 CPFE simulation of scratch test in a single crystal or close to a grain boundary is implemented into this GUI. Scratch length and scratch direction have to be set by the user. Figure 30 Screenshot of the preCPFE GUI for the scratch test. free topography (from an AFM measurement for instance). For the Berkovich, Vickers, cube corner indenters and the free topography, the faces and vertices are saved in a structure variable from a patch object. For the cono-spherical and the flat punch, geometries are already implemented in the Python package for MSC.Mentat and Abaqus. It is possible as well to call the Matlab function surf2patch, to return the faces and vertices from a surface object. Then the function patch2inp is used to generate an Abaqus .inp file, which is used when the CPFE model is created in MSC.Mentat or Abaqus. It is possible to rotate directly into the GUIs, the Berkovich, Vickers, cube corner indenters and the free topography before the generation of the Abaqus .inp file. Figure 31 Screenshots of the preCPFE GUI for the bicrystal indentation with Berkovich indenter. The topography from an Atomic Force Microscopy (AFM) measurement has to be saved into a .txt file in the Gwyddion ASCII format. Visit the Gwyddion website for more information. 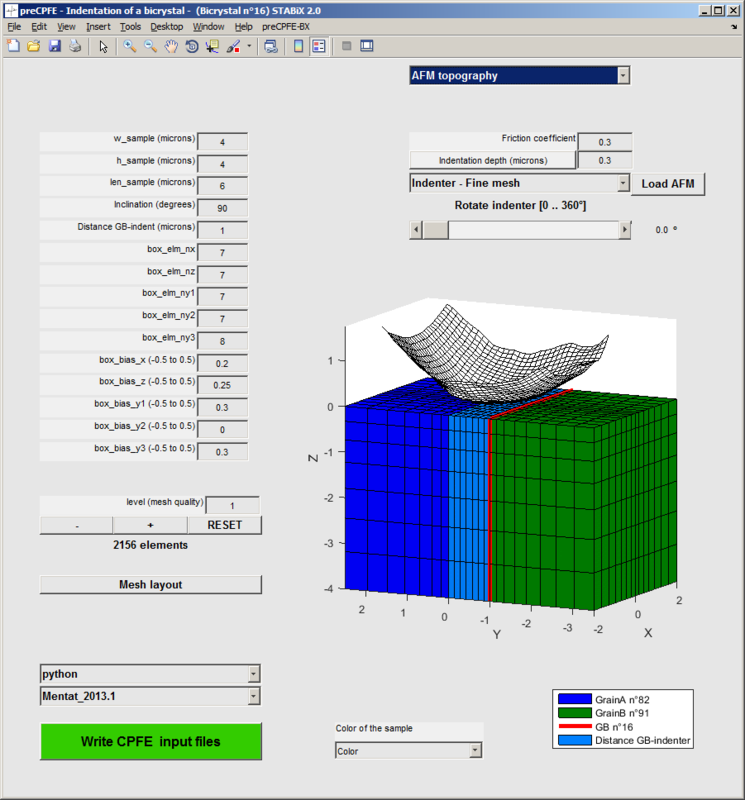 Figure 33 Screenshot of the preCPFE GUI for the bicrystal indentation with loaded AFM topography of the indenter. The indenter is modeled by a rigid body and the sample by a deformable body. Contact is defined by a bilinear Coulomb friction model. The external surface of the indenter is defined as the “master” region. The top surface of the (multilayer) sample is defined as the “slave” region. If the coefficient friction is different from 0, the classical isotropic Coulomb friction model is used to define the contact between the indenter and the sample. If the coefficient friction is set to 0, the contact is defined by a frictionless tangential behavior and a hard normal behavior. 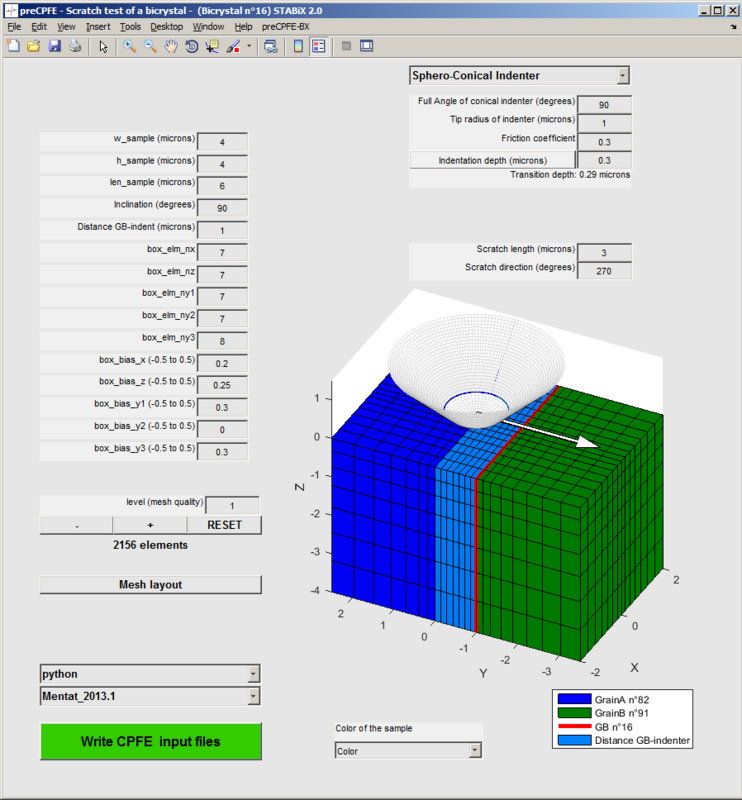 A friction coefficient of 0.3 is set by default for every CPFE simulation. It is possible to modify this parameter, by changing its value in the preCPFE GUIs. The mesh is defined by default by hexahedral eightnode elements (hex8). The mesh is defined by default by linear hexahedral eightnode elements (C3D8). It is possible to set quadratic elements (e.g. : C3D20), by changing in the python code the value of the “linear_elements” variable from 1 to 0. Note that DAMASK incorporates a limited number of different types of element geometries. For a detailed information about the characteristics of each element refer to MSC.Marc and Abaqus user’s manuals. For the generation of the CPFE preprocessing scripts an installation of Python is required together with the Numpy 1.10.4 ans Scipy 0.16.0 packages. Often one of the scientific Python distributions is the easiest way to get up and running (use a Python 2.x distribution). To make sure that STABiX can find the installed Python you will have to either put it on the system’s PATH or put it’s exact location in the user configuration as detailed below. To write out the necessary files for finite element simulations it is likely that the user wants to adjust some settings such as the used python installation or the path where the files are written to. This can be achieved in the custom menu of the preCPFE GUis : Edit CPFEM config file. A user specific copy of the default configuration YAML file is created and opened in the Matlab editor. To benefit from later changes in the default settings, all configuration parameters that are not specific to the user’s setup should be deleted from the user’s CPFE configuration file. For instructions on how to set up the DAMASK constitutive simulation code please visit http://DAMASK.mpie.de. After everything is configured and the model geometry and discretization is optimized, all necessary files to run a CPFE simulation can be generated by pressing the green button. All information will be written to a newly created folder which also includes a timestamp for later reference. In the JOB RUN menu choose USER SUBROUTINE FILE and select the interface routine DAMASK_marc.f90. Find the full documentation for the use of DAMASK with Marc here : http://damask.mpie.de/Usage/Marc. In the Job Manager > Create... specify the User subroutine file (either DAMASK_abaqus_std.f or DAMASK_abaqus_exp.f). Find the full documentation for the use of DAMASK with Abaqus here : http://damask.mpie.de/Usage/Abaqus. .for if the operating environment is Windows. Wang Y. et al., “Orientation dependence of nanoindentation pile-up patterns and of nanoindentation microtextures in copper single crystals”, Acta Materialia (2004). Liu Y. et al., “Combined numerical simulation and nanoindentation for determining mechanical properties of single crystal copper at mesoscale”, Journal of the Mechanics and Physics of Solids (2005). Zaafarani N. et al., “Three-dimensional investigation of the texture and microstructure below a nanoindent in a Cu single crystal using 3D EBSD and crystal plasticity finite element simulations”, Acta Materialia (2006). Zambaldi C. et al., “Modeling and experiments on the indentation deformation and recrystallization of a single-crystal nickel-base superalloy”, Materials Science and Engineering A (2007). Liu Y. et al., “Orientation effects in nanoindentation of single crystal copper”, International Journal of Plasticity (2008). Zaafarani N. et al., “On the origin of deformation-induced rotation patterns below nanoindents”, Acta Materialia (2008). Casals O. and Forest S., “Finite element crystal plasticity analysis of spherical indentation in bulk single crystals and coatings”, Computational Materials Science (2009). Gerday A. F. et al., “Interests and limitations of nanoindentation for bulk multiphase material identification: Application to the β phase of Ti-5553”, Acta Materialia (2009). Britton T.B. et al., “The effect of crystal orientation on the indentation response of commercially pure titanium: experiments and simulations”, Proc. R. Soc. A (2010). Chang H.-J. et al., “Multiscale modelling of indentation in FCC metals: From atomic to continuum”, C. R. Physique (2010). Zambaldi C. and Raabe D., “Crystal plasticity modelling and experiments for deriving microstructure-property relationships in γ-TiAl based alloys”, Journal of Physics (2010). Zambaldi C., “Micromechanical modeling of γ-TiAl based alloys”, PhD Thesis (2010). Zambaldi C. and Raabe D., “Plastic anisotropy of c-TiAl revealed by axisymmetric indentation”, Acta Materialia (2011). Vu-Hoang S. et al., “Crystal Plasticity of Single Crystal and Film on Substrate Probed by Nano-lndentation: Simulations and Experiments”, Mater. Res. Soc. Symp. Proc. (2011). Eidel B., “Crystal plasticity finite-element analysis versus experimental results of pyramidal indentation into (001) fcc single crystal”, Acta Materialia (2011). Zambaldi C. et al., “Orientation informed nanoindentation of a-titanium: Indentation pileup in hexagonal metals deforming by prismatic slip”, J. Mater. Res. (2012). Zahedi A. et al., “Indentation in f.c.c. single crystals”, Solid State Phenomena (2012). Liu M. et al., “Crystal Plasticity Study of the Effect of the Initial Orientation on the Indentation Surface Profile Patterns and Micro-Textures of Aluminum Single Crystal”, Advances in Materials and Processing Technologies (2013). Han F. et al., “Experiments and crystal plasticity finite element simulations of nanoindentation on Ti-6Al-4 V alloy”, Materials Science & Engineering A (2014). Choudhury S.F. et al., “Single Crystal Plasticity Finite Element Analysis of Cu6Sn5 Intermetallic”, Metall. and Mat. Trans. A (2014). González D. et al., “Numerical analysis of the indentation size effect using a strain gradient crystal plasticity model”, Computational Materials Science (2014). Esqué-de los Ojos D. et al., “Sharp indentation crystal plasticity finite element simulations: Assessment of crystallographic anisotropy effects on the mechanical response of thin fcc single crystalline films”, Computational Materials Science (2014). Kitahara H. et al., “Anisotropic deformation induced by spherical indentation of pure Mg single crystals”, Acta Materialia (2014). Kucharski S. et al., “Surface Pile-Up Patterns in Indentation Testing of Cu Single Crystals”, Experimental Mechanics (2014). Liu M. et al., “A crystal plasticity study of the effect of friction on the evolution of texture and mechanical behaviour in the nano-indentation of an aluminium single crystal”, Computational Materials Science (2014). Yao W.Z. et al., “Plastic material parameters and plastic anisotropy of tungsten single crystal: a spherical micro-indentation study”, J. Mater. Sci. (2014). CPFEM simulations of nanoindentation - ongoing research. Zambaldi C. et al., “Orientation dependent deformation by slip and twinning in magnesium during single crystal indentation”, Acta Materialia (2015). Sánchez-Martín R. et al., “High temperature deformation mechanisms in pure magnesium studied by nanoindentation”, Scripta Materialia (2015). Mao L. et al., “Explore the anisotropic indentation pile-up patterns of single-crystal coppers by crystal plasticity finite element modelling”, Materials Letters (2015). Mao L. et al., “Crystal plasticity FEM study of nanoindentation behaviors of Cu bicrystals and Cu–Al bicrystals”, J. Mater. Res., (2015). Renner E. et al., “Sensitivity of the residual topography to single crystal plasticity parameters in Berkovich nanoindentation on FCC nickel”, International Journal of Plasticity, (2015). Juran P. et al., “Investigation of indentation-, impact- and scratch-induced mechanically affected zones in a copper single crystal”, Comptes Rendus Mécanique, (2015). Materna A. et al., “A Numerical Investigation of the Effect of Cubic Crystals Orientation on the Indentation Modulus”, Acta Physica Polonica A, (2015). Csanádi T. et al., “Nanoindentation induced deformation anisotropy in β-Si3N4 ceramic crystals”, Journal of the European Ceramic Society, (2015). Liu M. et al., “A combined experimental-numerical approach for determining mechanical properties of aluminum subjects to nanoindentation”, Scientific Reports, (2015). Su Y. et al., “Quantifying deformation processes near grain boundaries in α titanium using nanoindentation and crystal plasticity modeling”, International Journal of Plasticity, (2016). Weaver J.S. et al., “On capturing the grain-scale elastic and plastic anisotropy of alpha-Ti with spherical nanoindentation and electron back-scattered diffraction”, Acta Materialia, (2016). Han F. et al., “Indentation Pileup Behavior of Ti-6Al-4V Alloy: Experiments and Nonlocal Crystal Plasticity Finite Element Simulations”, Metallurgical and Materials Transactions A, (2017). Chakraborty A. and Eisenlohr P., “Evaluation of an inverse methodology for estimating constitutive parameters in face-centered cubic materials from single crystal indentations”, European Journal of Mechanics - A/Solids, (2017).